From the beginning, pu-erh tea has been an esteemed brew. The very first book on tea (The Classic of Tea, written in the eighth century by Lu Yu, whom the Chinese sometimes call the “Father of Tea”) extols this tea’s virtue above all other varieties. Pu-erh gets its name from a city in the remote southern mountains of China’s Yunnan Province, but in truth it can come from anywhere in those mountains, where for two millenia tea from the broad-leafed Assam tea trees has been grown and produced. 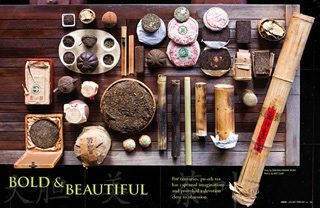 (Pu-erh-style teas have also been produced for centuries in the neighboring provinces of Guangdong, Guangxi, Sichuan, Hunan, and in the border areas of North Vietnam, but in 2003 the Chinese government defined authentic pu-erh as coming solely from Yunnan.) Tea plantations and wild groves are cultivated at altitudes in excess of 5,000 feet and flourish in Yunnan’s warm, humid climate. While the term “wild” is common in labeling, most older tea trees are cultivated trees that were left unmanaged for years and now grow naturally. One of Yunnan’s largest ancient tea plantations covers more than 10,000 acres in the old-growth forests of the Jing Mai and Man Jung Mountains. Yunnan’s oldest tea trees are treasured as living fossils: One of the oldest trees on record, discovered in 1961 growing on the Great Black Mountain of Bada San, is 1,700 years old. The cultivation of pu-erh tea in China dates back as far as the first century, and as trade routes developed throughout Central Asia, tea was one of the first things to travel along them—as a Chinese proverb puts it, “Better to be deprived of food for three days, than tea for one.” In order to make their tea easy to transport on these long journeys—it could take a year for a horse-drawn caravan to reach Tibet, for instance—the Yunnanese began compressing it into bricks, cakes, bowls and, later, fanciful shapes like mushrooms and pumpkins. These long treks to market also led tea merchants to discover that the broad, tough leaves of pu-erh trees had a singular ability to improve over time, becoming earthier and more complex. Eventually, the finest teas were intentionally aged to increase their value, and by the 17th century, aged pu-erh was being sent as tribute to the Chinese emperors. Pu-erh comes in two basic styles: raw (sheng) and cooked (shou). All tea starts as sheng, when green tea leaves are wilted, fried, rolled and sun-dried. Then, there’s the option of “cooking” the tea into shou, a process invented in the 1950s but popularized in the 1970s as a way to imitate the long aging process of raw tea. (Today, cooked pu-erh is more popular than raw in Hong Kong.) The tea ferments in a warm, humid environment for up to one year, in a process that deepens and mellows the flavors and adds increasing amounts of complexity to the tea. Whether raw or cooked, at this point, the pu-erh—which has a distinctively astringent and tannic character—can be sold loose. Normally, however, it is compressed into salad-plate-sized cakes (or, sometimes, bamboo stalks, baskets or even hollowed-out pomelo grapefruit) and allowed to sit for years for what is essentially an extended microbial fermentation. Just as a wine can evolve over time, pu-erh flavors can change dramatically as the compressed tea and the beneficial fungi it harbors continue to interact. At the same time, technology has been key in boosting pu-erh’s popularity—namely, the Internet. Fong says he started noticing his American customers becoming more knowledgeable as more information became available online. “That’s where it sprang up like wildfire,” he says. Indeed, a host of tea-centric blogs post reviews of pu-erh. Then there’s the Puerh Tea Community group at Livejournal.com, where more than 250 members (both long-time pu-erh collectors and newbies) debate tea quality, aging and prices and post photos of their latest discoveries. Since then, Hoffman’s seen it all, from cheap knock-offs to factories that deliberately falsify the date on the ticket pressed into each cake to identify its age. And he’s not the only one to spot this ugly trend: Many of the posts on that Livejournal discussion group involve asking or warning about forged or poor-quality teas. When Jimmy and Yume Han opened Beer Belly in LA’s Koreatown neighborhood in 2011, they added a fresh spin to the city’s already burgeoning beer culture.